You are currently shopping for 1 800 Flowers deals on DealFly. EXCLUSIVE Spice things up with our fresh floral version of the popular wine punch. 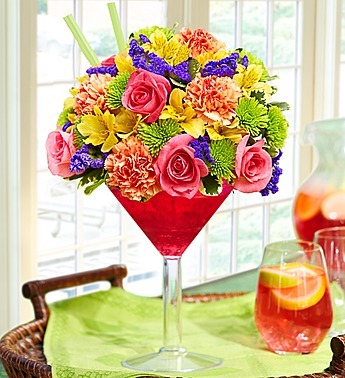 Our florists gather a kaleidoscope of roses, carnations, alstroemeria, poms and statice and hand-arrange them with in a chic acrylic martini glass to resemble a glass of sangria. Send one today and you’ll have them dancing the samba in no time.